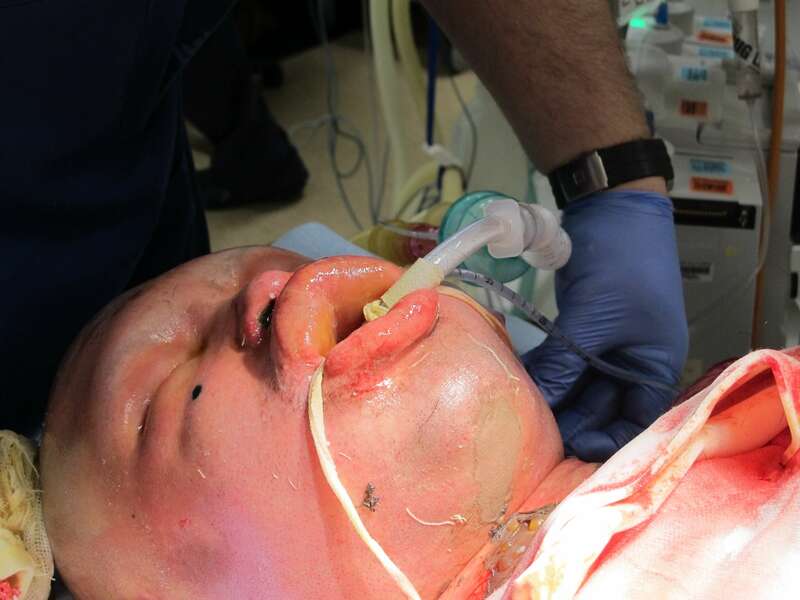 If airway patency is at risk due to inhalation injury or worsening upper airway oedema or facial/neck swelling, discuss endotracheal intubation with the ARV consultants prior to retrieval. Consider intubation in patients whose airway is at risk. Administer humidified 100% oxygen at a rate of 15 L/min. Sit the patient up if possible. Stridor is an immediate indication for intubation. ‘Prophylactic’ intubation if there is significant or reasonable doubt regarding airway patency during transfer. This is particularly important in cases of long transfer times or transfer delays. Capnography MUST be available to assess placement of the endotracheal tube in the trachea. Ongoing ETCO2 monitoring should inform the assessment of ventilation adequacy. Patients that have undergone anaesthesia and ventilation have a greater risk of hypothermia and efforts should be made to minimise heat loss. Administer 100% high flow (15 L/min) humidified oxygen via a mask or endotracheal tube. Oxygen post-intubation/ventilation should be guided by blood gases. Oxygen therapy is fundamental in patients with suspected inhalation injury or cyanide poisoning, and assists with overall organ oxygenation and tissue perfusion. Sit the patient up if possible to minimise airway oedema. Escharotomy is a high risk procedure and should only be performed after consultation and advice from the appropriate Burn Service.